New Englanders -- an assuredly hardy people, to have endured so much -- complain about a lot of things: the traffic, the weather, how the weather affects the traffic, and Fever Pitch. But one thing you'll never hear them gripe about is the food. Growing up in the land of Dunkin' Donuts is great, sure, but it's the everyday small-town delis, cafeterias, diners, and ubiquitous "houses of pizza" that make it exceptional. So, to honor the snacks that got us through several Nor'easters (relatively) unscathed, here's a list of 22 of the best New England foods. Hopefully by now you know that we don't even need to list clam chowder. 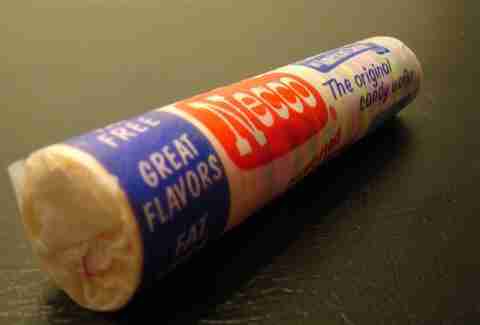 These are certifiably gross, but you still ate them because they were there. The Mt. Everest of shi*ty candies. Their only redeeming quality was that, according to neighborhood legend, they would produce sparks when chewed in the dark. Many nickels were wasted at the general store buying pack after pack in the name of science. Knocking back your first sip of Moxie was more or less a rite of passage, and let’s be honest -- not too many people passed that test. You still get excited when you see bottles of it in your local convenience store, but that excitement quickly fades to indifference just like its sweetness fades to that weird bitter flavor. Doesn’t stop you from giving it a second shot, though. 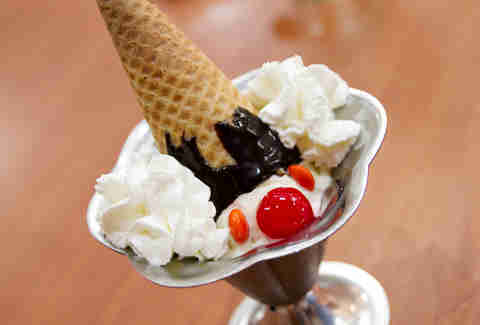 Of course, that Friendly’s sundae with the face was going to be your dessert whenever you went there. The real variable was what to eat for dinner, because your parents told you that you couldn’t just skip it and go straight to ice cream -- and their Buffalo chicken tenders are pretty sublime. Well, I guess you could go with pretty much anything that isn’t a Fishamajig. The requisite drink order with any menu item at any of the pseudo-NY delis along 91 or 84, or with any slice of New Haven pizza. 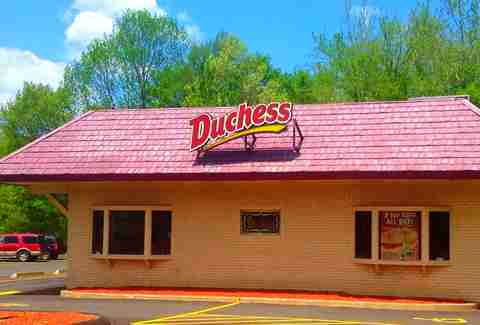 Duchess is more or less a Connecticut-specific thing, but what New England kid didn’t take a road trip down there and gaze longingly at the unfamiliar fast-food signage? 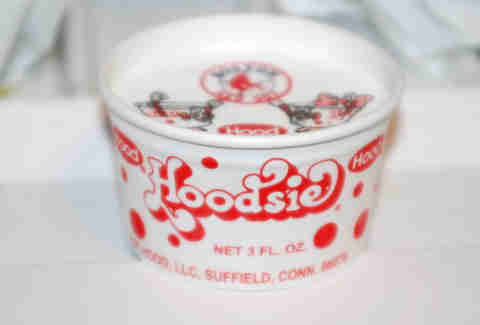 Connecticut kids knew that anything here was fair game. 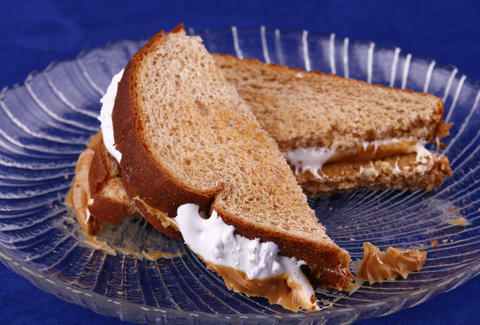 This cafeteria lunch staple was the ideal alternative to boring ol’ regular milk. Chocolate milk? So rest-of-the-country. Coffee milk made you debonair. Plus, you felt pretty adult for drinking it, even if it didn’t have the same caffeine level as your parents' cup of joe. 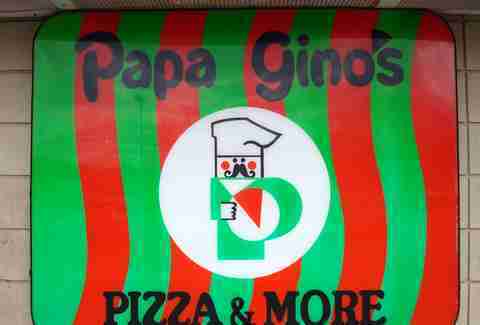 Ah, Papa Gino’s -- ye of the false frescoes of Italian countryside life. Many birthday parties were held here, many cups of Surge spilled over, and many pizzas eaten. Most New Englanders take for granted the fact that Papa Gino’s is basically our best regional pizza chain. Go ahead and try it for old time’s sake -- it’s still damn good, even without the Surge. Blah blah blah, unofficial state sandwich of Massachusetts, blah. It wasn’t a real summer without a beachside lime rickey, typically of the raspberry variety. From Fairfield to Kennebunkport, these syrupy suckers could be found in most places fried seafood was also served. If your childhood was anything like mine, school field trips to maple-making country were plentiful. 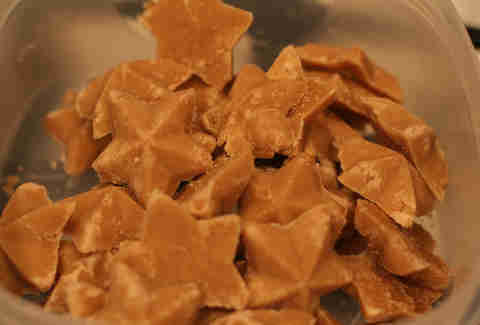 And since a full bottle of that sh*t can -- when it’s authentic -- be extremely expensive, they usually just sent you home with a handful of these weirdly grainy maple syrup candies instead. They were gone before the bus ride was even over. It may come as a bit of a shock that the ice cream flavor Purple Cow -- black raspberry ice cream with white & dark chocolate chunks and raspberry chips -- isn’t found everywhere. That shock will soon turn to gleeful covetousness. Even though you invariably ended up scarfing one side down completely, and then grudgingly nibbling at the other, you most likely loved these things growing up. Something about their yin-and-yang dualism was comfortingly zen. Your town definitely had an “[INSERT NAME OF TOWN] House of Pizza” or an "[INSERT STANDARD FIRST NAME]'s Pizza", and they likely served up that Greek style of pizza that you took to be the only style of pizza that existed in the world outside of Papa Gino's and Regina until you went to college with an Italian kid from Brooklyn named Anthony. Its traits include a thick layer of cheese, crispy, semi-thick (usually bland) crust soaked through with oil, and oregano-infused tomato sauce. Mmmmm. Someone pass the (fake) grated Parmesan! 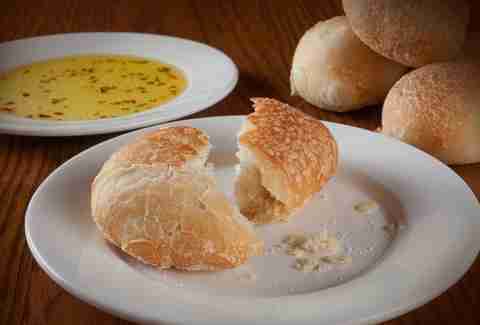 It didn’t matter how much your family bickered over where to go or what to order when you got there, because if the idea of going to Bertucci’s crept into at least one person’s mind, everyone would agree to go there just based on the merit of their fresh-baked rolls alone. Depending on where you were in New England, one of these two companies’ chips were commonly served as a side dish to any grinder, hot dog, or larger bag of chips. This is what we call milkshakes, except something about calling them “frappes” makes them taste better. D’Angelo was mostly Dad fare, if we’re being perfectly honest, but when that location opened up in your local mall, you had to see if ol’ Pops was right about it. Their Syrian bread pockets are actually pretty good, so maybe you should tell your Dad that you respect his taste. He’s waiting to hear from you, after all. Yes, at this point everyone in the country has sampled the red nectar off of Route 24's cranberry bogs, but the New Englander specificity comes from the fact that, at some point, your parents or school group probably toured the actual Middleboro facility, and you got to drink all those little cups of crazy flavors (like, um, peach!). Orange Dry Polar soda Worcester-based Polar Beverages makes a hell of a seltzer (and a pretty damn good raspberry lime rickey), but their Orange Dry soda is totally where it’s at. You’d regularly pick some up from Honey or Cumberland Farms and might even have deemed it worthy of an allowance splurge. 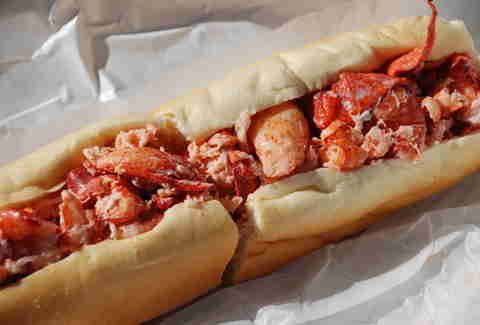 There’s a huge divide between Connecticut and Maine styles of lobster rolls, but nowhere really does these seafood sandies better -- in general -- than New England. 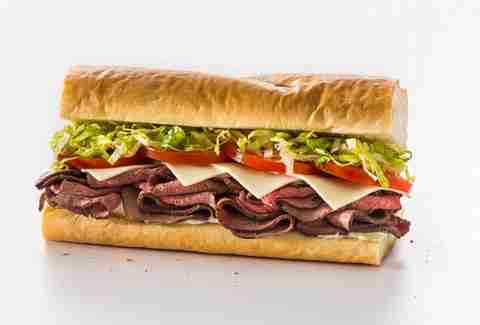 Regardless of whether you took yours with butter or with mayo (though the correct version is cold with mayo, dammit! ), you got them from a briny-looking clapboard shack or you didn’t get them at all. This classic school lunchtime dish takes many forms, not unlike a tomatoey Doctor Who. You never quite knew what was in it, but dammit, it never really mattered. You were curious just that one time. Adam Lapetina is a Food/Drink staff writer for Thrillist, and searches every day for signs of a Friendly's opening in New York City. Read his musings at @adamlapetina.